Soufriere in the south is the oldest settlement on the island, having served as the French capital in the 18th century. 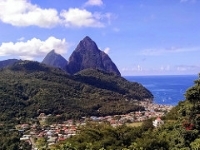 The deep-water port stands at the base of St Lucia's main landmarks, the two towering extinct volcanoes known as the Pitons, rising to 2,619 feet (798m) above sea level. The town itself is pretty, with a cluster of colourfully-painted arcaded buildings against the backdrop of dense jungle. Most visitors, however, are drawn by the nearby attraction of the 'drive-in' volcano, Mount Soufriere, where it is possible to enter by car into an ancient volcanic crater filled with sulphur springs and steam geysers. Also at Soufriere are the Diamond Mineral Baths, the Diamond Waterfall and the Diamond Botanical Gardens.